SpongeBob Squarepants will soon enough be back on the big screen with an all new movie, according to a listing from Production Weekly. Called The SpongeBob SquarePants Movie: It's a Wonderful Sponge, the project's principal photography has already begun at Paramount Animation. Full plot details aren't clear, but the movie will reportedly be a prequel, taking place prior to the events of the previous movies and Nickelodeon TV series. Reportedly, the origin story will take place at Camp Coral, revealing how he meets some of his very best friends like Patrick Star and Sandy Squirrel. Courtesy of Mikros Image (Captain Underpants: The First Epic Movie), the animated movie will use full CGI animation for the underwater sequences, which marks the first time for the franchise to do so. 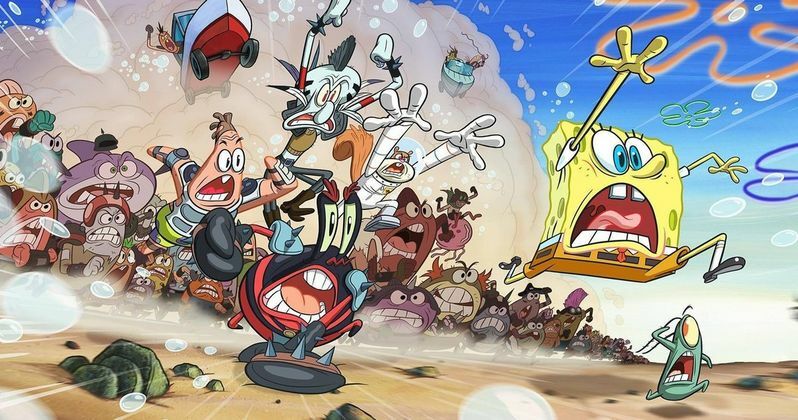 Live-action sequences will be featured as well, similar to the first SpongeBob movie. Sitting in the director's chair will be Tim Hill, known for his work on the TV series. Additionally, Hill co-wrote the script for The SpongeBob Squarepants Movie in 2004. Expected to lend their voices to reprise their roles as well are voice actors Tom Kenny, Bill Fagerbakke, Rodger Bumpass, Clancy Brown, Mr. Lawrence, Jill Talley, Carolyn Lawrence, Mary Jo Catlett, and Lori Alan. Composer Hans Zimmer will also be providing the music. Reportedly, the movie goes into production as of today, meaning new updates about its progress and other plot details are expected to be made available over the coming weeks. Sadly, this movie marks the first SpongeBob Squarepants production to follow Stephen Hillenburg's death. The creator of the franchise, Hillenburg passed away in November at the age of 57. Meanwhile, the TV series is currently airing new episodes for its twelfth season on Nickelodeon, remaining popular after so many years after its inception. Hillenburg's passing was certainly tragic, but it's nice to see the legacy he left continue to live on. As we can see, the franchise will continue to make some time on the big screen in addition to airing new episodes as a TV series. Even long past the time when the show comes to a close and movies stop being made, the titular character will still forever remain one of the most memorable and unique animated characters of all time. Recent rumors also suggest, Hillenburg will be getting more recognition for his work at the Super Bowl. A petition created earlier this year urged for a Super Bowl tribute paying homage to the late SpongeBob creator. The rock band Maroon 5, who will be performing the halftime show at this year's event, has lent some credence to these rumors, teasing they'll be showing Hillenburg some love in some way during their set. While nothing is confirmed, a video tweet from the band's official Twitter account shows footage of SpongeBob Squarepants for just a brief moment, hinting that a tribute to Hillenburg's work will be included after all. According to the listing, The SpongeBob Movie: It's a Wonderful Sponge will premiere in theaters on July 17, 2020. More updates on the movie's production should be coming soon, with animation now under way. This information comes to us from Pursue News.